Posted by nrhatch in Art & Photography, Mindfulness, Nature, Travel & Leisure. 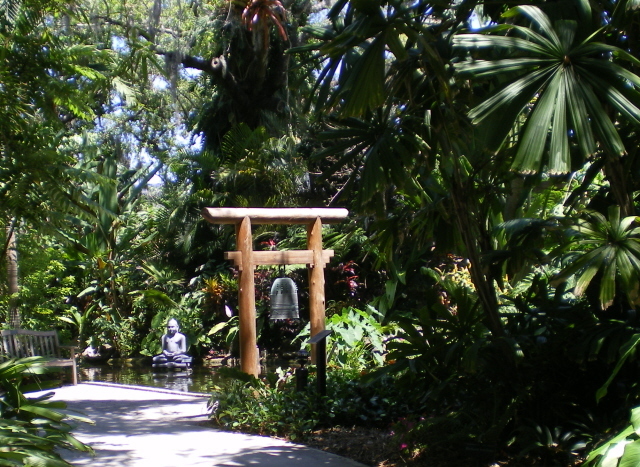 Yesterday, we visited Marie Selby Botanical Gardens in Sarasota Florida. We enjoyed perfect weather for our stroll around the grounds. We spotted a manatee in the bay . 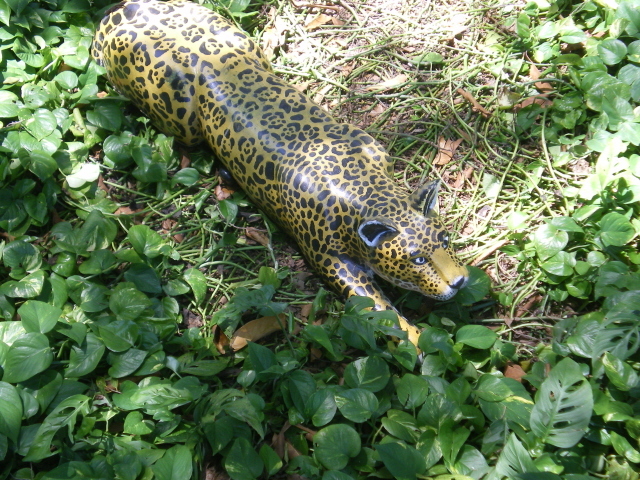 . . and a leopard in the grass. We watched some not-so-coy Koi having lunch . . . with baby ducks. We admired the flowers . . . and rubbed Buddha’s belly for good luck. We relaxed by a waterfall cascading into still waters. We allowed the ever-present peace within to surface. And . . . we stuck our heads into the hollow of this monolith. Put your head in the hollow of the stone and hum different notes. When you hit the right note, you will feel a gentle vibrating sensation in your body. The result is a harmonious feeling of well-being. Loved the koi fish and ducks and also the monolith at the end… must have been an exciting outing. Glad you got away for a relaxing visit. Hope Tigger is doing okay. Beautiful day . . . gorgeous gardens. I’m going to be posting more photos in the days to come. Thanks, Janna. We’ll be loading up the little guy in 30 minutes to take him to the vet. We’re cautiously optimistic that his fever and blood glucose reading will both be significantly improved. Wow – what a beautiful, relaxing day you had! I could sense a feeling of well-being – just what you needed. It was just what we needed. We waited until Tigger had settled in for his mid-day nap and then we tiptoed out . . . to give all of us a chance to recharge our batteries. I have never seen a humming stone before. It was wonderful. Even if you couldn’t HEAR the hum . . . you would FEEL its vibrations. Very calming and soothing. Now that’s the lonly kind of leopard I’d like to encounter without a barrier between us! Your photos are gorgeous, This place looks so peaceful; what a wonderful stroll away from it all. Thanks for sharing. I have a few more photos to share . . . the flowers, the bonsai, the banyon trees, etc. In 3 hours, I took 126 photos!!! ~ more than I have ever taken in a single day. Ever. Lovely place to wander around. The grounds include 14 acres with 8 acres of gardens of all types ~ succulents, wildflowers, butterfly gardens, bonsai, banyon, bromyliads, etc. Amazing. Sounds like a perfectly lovely Floradee-dah day! Glad you two took some time to just be. I am a lover of Botanical Gardens. St. Louis has a fine one. We have never been to the one in Sarasota. That will have to change! I feel in need of a visit to some lovely gardens today but they will have to be a little closer to home. Love your pictures this morning Nancy! Next time you and CH are here . . . you’ll need to schedule a visit. 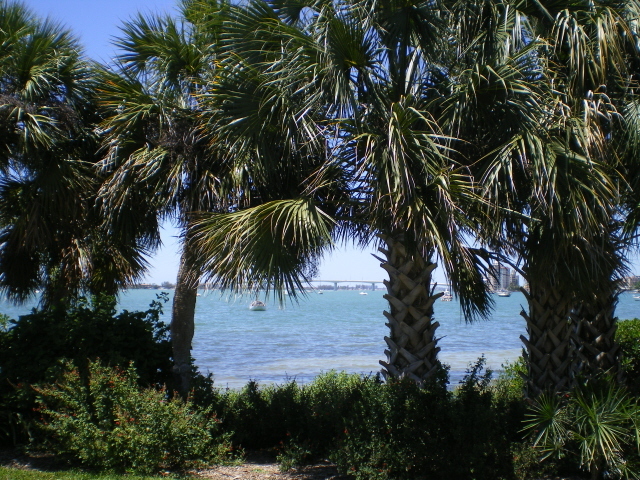 The gardens are just south of the bridge from the Marina to St. Armand’s Circle/Lido Key. Probably 30 minutes from Venice and well worth a wander. Isn’t this time of year, before the heat really comes, the best. Great photos. The temperature was PERFECT!!! Not too hot in the sun and not too cold in the shade. Just right. Yes! There are so many wonderful places around here ~ both indoor and outdoor. 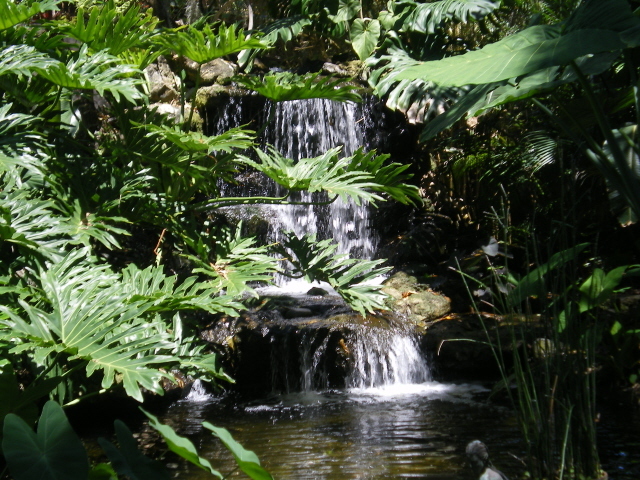 We also love the grounds at the Ringling Museum, the Mote Aquarium, the So. Fla Museum, GWiz, etc. We could play all day and never run out of things to do. Putting your head in the hollow of that stone seems kind of scary; claustrophobic and something like going to the guillotine. What a beautiful place, Nancy! Makes me want to visit our Botanical Garden! We don’t have quite as many tropical plants here, though (outside the ‘Climatron’, anyway)! Wait until you see some of the flower shots I took . . . probably tomorrow. AMAZING bio-diversity even among related species. We really needed a break from our “cares and concerns.” Strolling around the gardens did wonders for our frame of mind and perspective. Another gorgeous day today . . . off to the Vet. Paws crossed that the news is GOOD. I sure hope you do get some good news, Nancy! I’ve been thinking of Tigger! * Tigger’s temperature (102.3) is normal. He’ll remain on the antibiotics for 2 more weeks. * His glucose reading is better (321 . . . down from 379) but not normal. The vet gave us 2 more weeks to see if we can get his blood sugars to a normal range (between 100 and 220). If not, we’ve agreed to give insulin a try. Wonderful photos and narrative, Nancy! It sounds like a wondrous experience you are having! Very relaxing afternoon for us, Janet. Just what we needed after all the excitement of the past week. Gorgeous relaxing thoughts today, Nancy. And those really are incredibly sociable Koi! A calming oasis of peace for us yesterday. 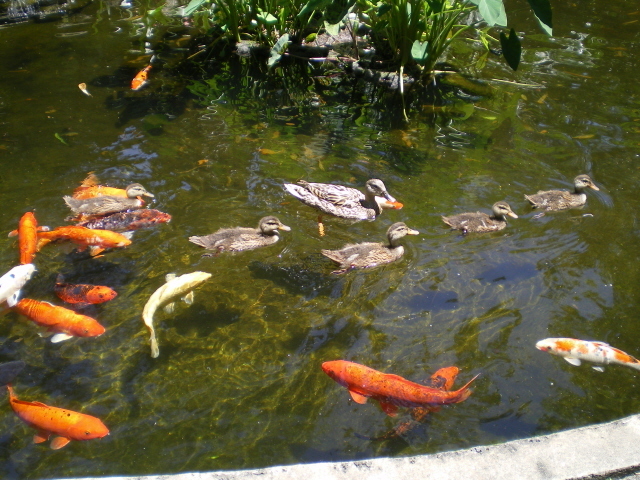 The baby ducks used the fish as platforms to climb up and out of the pool . . . then they waddled down the path with mom to the cafe to seek treats. Thanks, Jackie. We found it a lovely space for wandering. I love watching fish. I could do it for hours. Thanks for sharing these photos today, Nancy. The fish came up to the sides of the pool and let kids “pet” them. Very tame Koi. Thanks, Theresa. We’ve been meaning to check out the Selby Gardens for the past 3 years . . . yesterday was the perfect day for it. We’re delighted that Tigger is feeling a bit more spunky. And that we have 2 weeks to see if his blood sugars improve. Beautiful koi! !I would so love to have some and that humming stone in cool. Dr. Oz said something the other day about humming helps an underactive thyroid I think it was. I have read that before in Dr. Amens book. 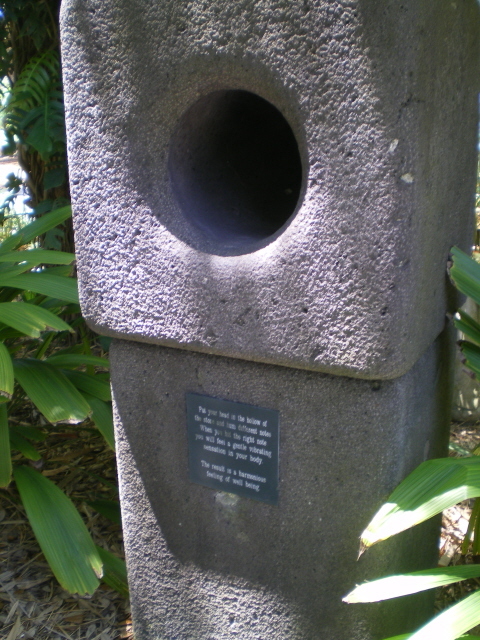 The humming stone’s vibration felt great . . . the magic of om? I’d like to try that monolith! Sounds like fun. . .and healthy! That reminds me of a place in Italy (I think) where it tests liars – if you put your hand in and lie, it will eat your hand, if not, it’s won’t. . .something like that – my memory is fuzzy – I’ve only read about it or seen it on TV. I like your monolith better! What a wonderful space. I hope to see it one day. 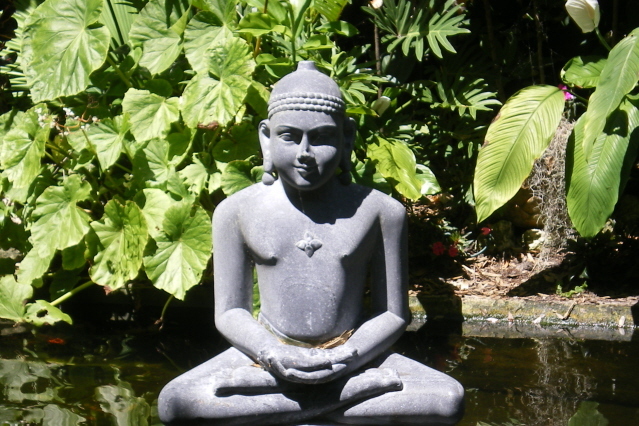 The vibrations reverberated and resonated and did create a sense of well being. What a lovely spot Nancy! I love the little waterfall. I have such a “thing” for waterfalls! We do too! When we lived in North Carolina, whenever we camped in the mountains, hiking to a waterfall often got top spot on the itinerary. We’d pack a picnic, hike to the falls, and chill out while we ate. 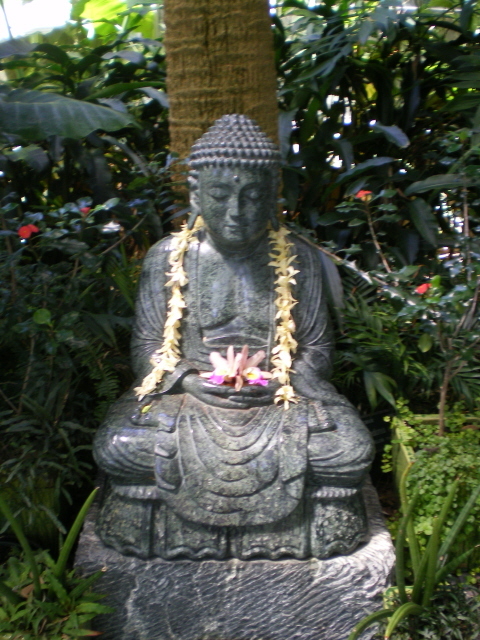 very peaceful – a Zen garden. We had an incredibly relaxing day there. Calm + Peace = Perfect! Greetings from Egypt! All of your pictures are very wonderful, but I’m crazy about that awesome, peaceful waterfall! Thanks for swinging by, Kathleen! The gardens are splendid. We loved the waterfall in the midst of all the ZEN.